I have a very bad habit of purchasing items and completely forgetting they exist as possible outfit choices during my "OMG I have nothing to wear" moments. It was only after doing a full closet clean up (which not only tested my mental capability but my physical ability to drag piles of clothing from point A to point B) that I stumbled onto this beautiful Michel Studio shirtdress from Addition Elle. I remember falling in love with the fit of the dress and being mesmerized by the geometric print. Although patterned, this dress works as a neutral in my closet, allowing me to pair it with bolder shades or dress it down with denim if need be. But, I think that my love of this dress stemmed from the fact that it could be both a dress and a jacket! That's like two outfits for the price of one (talk about a good deal)! 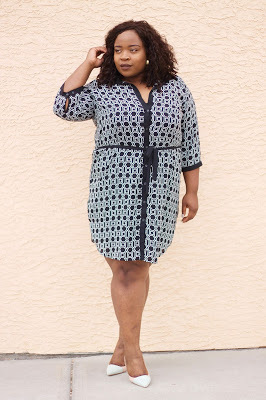 The versatility that comes with shirtdresses is often overlooked, with most individuals simply wearing the dress as is; however, being able to dress outside of the box opens up a plethora of outfit choices. Alone, this Michel Studio dress is a showstopper and, in my opinion, needs little to no additional work to make it stand out. This is why I opted to take the minimalist route when styling the shirtdress in its pure form, adding a pair of colour block pastel heels and small gold hoop earrings to round up the look. Sometimes less really is more and a more subdued approach to styling can create the greatest impacts. Shirtdresses are essential when it comes to a professional wardrobe. They are the easiest transitional piece you can own, maneuvering easily between very different styles. Wearing the dress as is adds a visually pleasing twist to the standard workplace wardrobe yet still manages to maintains that boss lady status. The skinny belt helps with defining a waist and the 3/4 sleeve and cutout sides and feminine touches in only a way that Michel Studio can. As if shirtdresses couldn't get any better, their ability to transform into a duster jacket crowns them queen of the workweek wardrobe. By simply unbuttoning the dress and parting ways with the belt, you are left with a duster jacket that can complete any outfit. You can pair it with a pencil dress or with a simple skirt and blouse combo. I opted for a more relaxed workday look that you pull out when Friday is close but not close enough and comfort is all you need. I did a subtle print mix with this second look, pairing the duster jacket with a print ankle grazer pant from Penningtons. I originally had wanted to keep this look monotone with either a black or cream blouse but when I saw this camisole from Penningtons in this fresh spring pastel green, I knew it would be the perfect punch of colour. Paired with some comfortable lace up flats and a bohemian inspired necklace, this look will make your humpday so much easier! There you have it - one shirtdress, two looks. No matter what shirtdress you have your eye on, be it patterned or denim, the versatility is unparalleled. You add so much value to your wardrobe with shirtdresses and legitimately open up a door of creative inspo when styling them. Next time you have a style rut, try re-imagining some of your favourite pieces in brand new ways!